Creo Coding is a web design and development company out of Shelburne Falls, Massachusetts. Since 2008, Creo Coding has helped over 35 companies of various sizes bring their vision to the web. We have worked with restaurants, solar companies, hospitals, nonprofits, consultants, carpenters, financial firms, and more. What makes Creo Coding stand out is our service. Every client receives a personalized experience not found with online web builders. We work with you every step of the way to make sure you receive a website that is more than just a tool, but a solution tailored to address your specific needs. With our available Maintenance Plans, you can always be assured that we have your back in case you ever need any additional features, help with social media, or support with hosting. Our websites are built to fit all of your needs while still focusing on style, functionality, and a great user experience on all devices. We use well known Content Management Systems (CMS) such as WordPress and Drupal and also build custom frameworks for sites when the need for a CMS is not required. I highly recommend to anyone looking for a quality experience in development and end result in web design to work with Creo Coding. Mobile friendly and accessible websites built using top of the line technologies such as Drupal and Wordpress. Constant module updates, security patches, and Optional Use Hours will keep your website safe from hackers and updated. We can host your website for you on our secure dedicated servers that include daily backups and disaster recovery. O... a very pleasant experience. Travis is patient, on top of things, prompt in his responses, competent and reliable. I strongly recommend him. We have created a series of development, maintenance, and hosting options for you to choose from. If you're not sure which one you should pick, let us know and we will meet with you to figure out which option best suites your needs. These are geared towards providing you with an affordable, high quality, and accessible website that will exceed your companies goals without draining your wallet. Already have a website and are looking to make sure it stays up to date with the latest security and content? Take a look at some of our maintenance plans. Our catering business has shown a strong steady growth since our launch, we continue to show increased hits and the social networking that you suggested has been an efficient and cost effective way to launch our cafe and chowderhouse opening. Thanks for your help and professionalism in guiding me through the proccess. 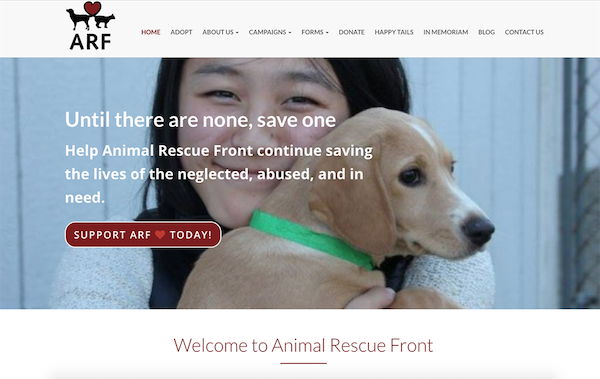 The Animal Rescue Front is an amazing non-profit organization founded in September 2005 immediately following Hurricane Katrina. ARF is currently responsible for saving the lives of over 6,075 dogs and cats, kittens and puppies, most from the state of Mississippi where companion animal overpopulation is a crisis and legal protections minimal. If you are looking for a professional, affordable, thorough and personal experience, need not look further. Travis is the ultimate in know how and endures those of us that " need schooling " with the utmost patience. His ideas will open your mind and expand your business potential more than you even thought possible! -- Melanie M.
Are you ready to give your business a boost like all the others that have worked with Creo Coding? *We will only send you promotional offers and information about our services. ©2019 Creo Coding | Web Design & Development Services out of Shelburne Falls, Massachusetts.